A clogged toilet, a toilet that runs constantly and a toilet seat that needs to be replaced are some everyday common toilet repairs. Whether you have a KOHLER®, American Standard or Eljer toilet — to name a few brands — most do it yourself toilet repairs can be done in the same way. You can start with a few do-it-yourself toilet repair methods before calling in a plumber. For example, when it comes to unclogging a toilet, you need to have a plunger. Sometimes the toilet bowl is really full of water when clogged and other times it may not have much water in the bowl at all. Here’s a quick do-it-yourself tip for toilet repair: It’s important to have enough water to cover the plunger. Add water to the bowl if needed. If you have been plunging and it’s still clogged, try using a metal hanger or toilet auger. A toilet that won’t stop running can sometimes be an indicator that your flapper is not closing properly or the chain is broken or needs to be adjusted. You can determine if your tank flap is not working by taking off the lid of your toilet and reaching down to the flap and pushing it down. If you push the flap down and the water stops running, it’s time to buy a new part. Be sure to bring the piece that needs to be replaced with you to the DIY hardware store to make sure you buy the right one. Replacing a toilet seat is relatively simple. The hardest part can be unscrewing the bolts because they have been in place for so long. When you do it yourself, try using a lubricant to loosen the bolts. Be careful not to scratch the bowl with the wrench or hacksaw if you end up having to cut the bolts off. Once you put the new lid on, don’t tighten the bolts too tight so it’s easier next time you need to take it off. If your do it yourself toilet repair requires more than a plunger or a new tank component, it’s time to call in a professional. 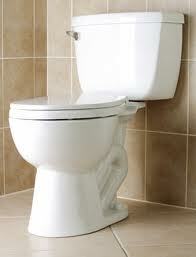 Contact Roto-Rooter Ventura County at (805) 620-3700 for help with your toilet repair.